Tattoos… they are painful and permanent, yet everyone seems to want one. However, what seemed like a good idea at the time may later turn out to be a cause for remorse. Tattoos are nothing but injections of colored ink into the skin that result in permanent and decorative images. Some prefer to get small tattoos while others literally fill their whole body with ink to symbolize their love and passion for something close to their heart. There are many reasons why people get inked, but, on the flip side, there are several more reasons the same people want to remove their once-cherished tattoo! Jeepers! Let us take this scenario: A couple madly in love decide to get inked with each other’s names, symbolizing their true love. But then, after some time, they break up. All ties and bonds are broken; yet the scar bearing their name still remains! 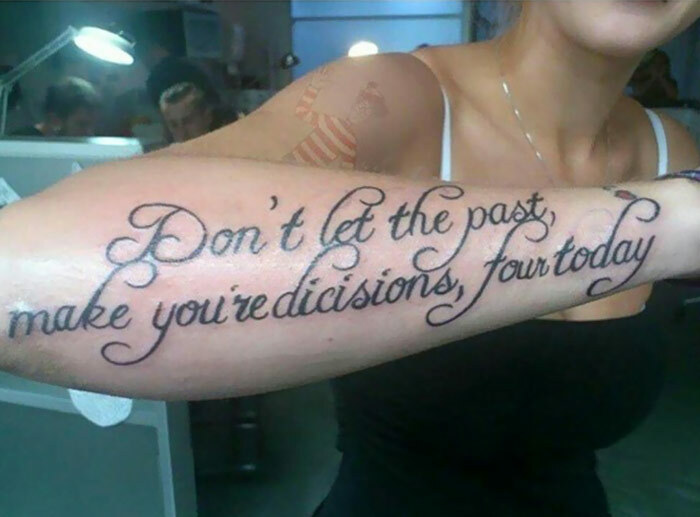 Now that’s what we call the “inked mistake of your life”! With the advancement in the cosmetic treatments and surgeries, there are some techniques that will help you get rid of those unwanted tattoos. How To Remove Permanent Tattoos? Sandpaper can help in the removal of permanent tattoos. In this process, sand paper is used to scrape down the skin until the tattoo marks are rubbed off the skin. However, there is no guarantee that your tattoo will go completely removed. Also, there is a good chance of a scar being left behind. Not to mention, you will have to bear ample amounts of pain! For many years, salabrasion was one of the few methods used for tattoo removal. Salabrasion is probably the most painful, agonizing, and uncomfortable method of removing tattoos. The procedure involves scrubbing off the epidermis, the topmost layer of the skin, and getting down to the dermis, the second layer of the skin. Dermis is the area where the tattoo ink is present. Each session of salabrasion takes around half an hour of massaging the scrubbing salt into the skin. The procedure can be incredibly painful and may leave scars behind. It can also result in skin infections or cause side effects likes itching, swelling, continuous bleeding, and burning sensations. In this method, the tattoo is sanded with an instrument to remove all of the middle layers of the skin. It is performed under an anesthetic. This tattoo removal method may cost thousands of dollars, depending on the size of the tattoo. While performing the excision tattoo removal method, the entire area of the skin, where the tattoo is placed, is cut out. Once the tattooed skin is removed, the surrounding area is sutured together. If you have a small tattoo, then the tattoo can be excised in a single session, while if you have larger tattoos, then several appointments might be required. Excision can also result in scars. During the chemical peel tattoo removal treatment, a chemical solution is applied over the tattoo that creates a blister. Later, the blister is peeled off. This method is usually performed in surgery centers and most people feel a burning sensation, followed by numbness. This process is not recommended for smokers. Cryosurgery, also known as cryotherapy, is not only used to remove warts and skin cancers, but also tattoos. During this surgery, the inked skin is exposed to extreme cold by means of a sprayed-on freezing agent, liquid nitrogen, to induce frostbite. Once that is done, the area is sanded through dermabrasion to remove the top layers of the skin. While the cryosurgery can be considered as an effective way to remove a tattoo, there are many drawbacks that make it an undesirable procedure. This method is not effective in removing tattoo colors like yellows and greens. Cryosurgery is categorized as cosmetic surgery and is hardly ever covered by insurance policies. The greatest drawback of this procedure is that it can damage not only the tattoo area, but the nearby tissues as well. Some DIY creams are available in the market that claim tattoos fade away upon application. They are fairly inexpensive, but require a lot of time and patience to show effects. They contain some chemicals such as TCA, kojic acid, alpha arbutin, and hydroquinone, which help to dissolve the tattoo. Application of these creams may result in permanent scarring and possible side effects. This laser tattoo removal technique involves the penetration and breakup of tattoo particles that are injected into the skin with the help of a laser. There are many different types of laser treatments that are being used for tattoo removal. Passive laser treatment is one of the cheapest tattoo removal treatments available. However, this method causes your tattoo to fade only partially. This is the reason most of the clients feel disappointed after opting for this method. Active laser treatment is one of the best ways to remove tattoos permanently. The tattoo removal machine breaks down the color pigments into smaller particles that can be easily absorbed into the body. However, it is not successful in removing colored tattoos. It is an expensive tattoo removal technique. Q-switched ruby laser treatment is very effective in removing the black and blue pigments present in the tattoo. However, this technique doesn’t work for green, yellow, and red colors. Q-switches ND-YAG aka Neodymium-Doped Yttrium Aluminium Garnet Laser Rays are visible to human eyes and work best in removing colored inks like red, blue, yellow, black, and green. The laser rays contains potassium titanyl phosphate crystals that help to double the frequency of laser lights and reach deeper inside the skin tissues than other laser rays. This is one of the most popular and effective laser treatments as it has the ability to remove the leftover green pigments as well, which is not possible with the other treatments. It is one of the most expensive and effective laser treatments. The effectiveness of these tattoo removal methods depends on the type of ink used, size of the tattoo, the location, and the age of the tattoo. Also, if you are planning to go with any of the above methods, be aware that it may result in severe pain and scarring. Now that you know how to remove permanent tattoo, I would suggest that rather than going through all the pain and trouble, think twice before getting inked. The ultimate decision is yours!